The Islam Awareness Blog: Amos Oz: What goes around comes around! 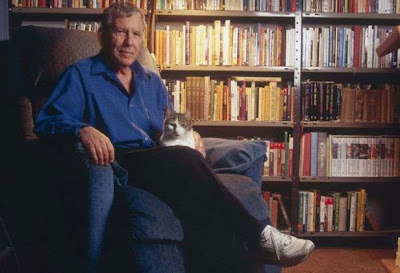 Amos Oz, 70 is Israel's most distinguished novelist, its most passionate defender, and its most notorious "traitor" – a word he uses about himself. His friend David Grossman says "Amos is the offspring of all the contradictory urges and pains within the Israeli psyche." To spend a day in his company – to follow his story from the birth of the state to the suicide of his mother, from Zionist idealism to a broken heart – is to tour the dizzying dissonances of the Jewish state as it staggers into the 21st century. Oz once dreamed of bombing London. He was once a child of what he calls "the Jewish intifada" – the stone-throwing, death-defying Jewish rebellion against British occupation. He believed the state that would emerge from the rubble would be a model of justice and idealism for all mankind. If you were a child in Gaza now, Mr Oz, would you be dreaming the same dreams against Israel? "I don't even have to imagine the answer to this question – I know it," he says. "Because I was a kid in Jerusalem in '48 when the city was besieged, shelled, starved, [and] the water supply [was] cut off. And I know the horror, and I know the despair, and I know the hopelessness, and I know the anger, and I know the frustration." He says he was "not so much a child as a bundle of self-righteous arguments, a brainwashed little fanatic, a stone-throwing chauvinist. The first words I ever learnt to say in English were 'British, go home!'" In his novel Panther in the Basement, he writes: "This is how I remember Jerusalem in that last summer of British rule. A stone city sprawling over hilly slopes. Not so much a city as isolated neighbourhoods separated by fields of thistles and rocks. British armoured cars stood at street corners with their slits almost closed, their machine guns sticking out in front like pointing fingers: You there!" At the age of eight, he built "an awesome rocket" in the backyard of his house. His plan was "to aim it at Buckingham Palace. I typed out on my father's typewriter a letter of ultimatum addressed to His Majesty King George VI of England... Torrents of blood, soil, fire and iron intoxicated me." His favourite song – a Stern Gang anthem – proclaimed: "We must fight until we breathe our last breath!" So how did this boy, from this place, end up co-founding Peace Now, and fighting for a free Palestinian state alongside Israel? What contortions did he travel along the way, and since? And how did Israel's story come to this? Read the complete article in The Independent here.